In 2002, when EMF introduced the Great Western II “Californian” single action revolvers. True to Colt’s original SAA, with the floating firing pin, t he “Californian” models feature hammer forged steel barrels, which are highly polished and blued. The CNC machined, dropforged frames are colorcasehardened, in Pietta’s signature deep, rich combination of blues, browns, and purples. These frames are an improvement on the traditional casted frames of the Colt single action revolvers. The wider rear and larger front sights offer faster sight acquisition. The combination of traditional esthetics and the best modern technology made the Great Western II “Californian” a popular, durable, and reliable single action on the market for the last 17 years. The GWII Deluxe “Grande Californian” model elevates the classical beauty of the “Californian” to a completely new level! Elegantly engraved with a combination of Victorian scrollwork and sunbursts on the blued barrel and deep rich colorcasehardened frame, it is accented with a one-piece diamond checkered grip. If you want an engraved SAA on a budget, this is a very atractive package. Available in .357Mag or 45LC, the Deluxe “Grande Californian” has a 4 ¾” barrel. Flathead Valley Community College is hosting the NRA Short Term Gunsmithing Program again this summer. 2014 will be the third year for this program at FVCC, the program has grown in attendance each year and this year should be no different. New classes are being offered so if you attended or looked at the offerings in the past there is probably something new for you this year. Quality instruction is the name of the game at FVCC. The instructors for the Short Term Program are all top notch professionals who are well respected in the gunsmithing community. For instance, Lee Helgeland is one of the premier stockmakers in the nation. He has spent 30 years perfecting his craft and is a member of the American Custom Gunmakers Guild. Another instructor new to the Kalispell program this year, Sam Hatfield, certified NRA and Sig Academy Master Instructor. Sam was head gunsmith at Green Mountain Guns in Lakewood, Colorado and served as a member of the United States Army Marksmanship Unit as a gunsmith. Sam now owns Hatfields Gunsmithing Inc. in Manassas, VA.
New classes this year include “S&W Revolver Action Work”, “1911 Handgun AMU Accuracy Rebuilding” and “Accurate Reloading for the Hunter”. Perennial favorites like “Customizing AR-15 or AR-10” and “Introduction to Checkering” will still be on the schedule. If you have ever wanted to learn more about gunsmithing but can’t take of the two years necessary for most schools, the NRA Short Term Gunsmithing Program is a great alternative. Classes normally run or one week, Monday through Friday. They are intensive hands on classes with small numbers of students, so you have great access to the instructor. This unique learning opportunity is set up as part of the Continuing Education Department of the College and the courses are non-credit. Taurus is showing a new variation on their model 85 called the “View”. It sports a translucent panel where the side plate would normally be, allowing a view of the mechanism as the gun is cycled. Designed for concealed carry it utilizes an aluminum frame and a titanium cylinder to hold weight down. Chambered for 38 Special this ultra-light revolver holds five rounds. Empty it weighs in at only nine ounces. With a snub nose 1.41″ barrel a round but and spur-less hammer this revolver would be easy to carry. The side plate is a gimmick but one that many shooters would like. Top it all off with a double action trigger pull of 10 pounds. Magnum Research is offering a new compact version of the 1911 for 2014. Dubbed the “Undercover” model, or the 1911U this variant is a Series 70 style. The DE1911U is built on an ultra lightweight frame made of aircraft grade aluminum alloy and features a 4140 high carbon steel slide and adjustable rear sight for windage and elevation. 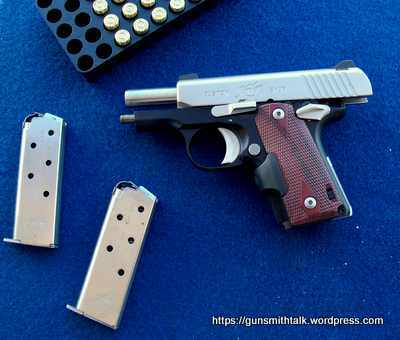 The .45 ACP DE1911U has 6+1 round capacity, an overall length of 6.85″, a 3″ barrel, height of 5″, and weighs just 25.8 oz. Standard features include checkered front and back strap, double diamond checkered wood grip, and stainless steel hex screws. The DE1911U also has a high-rise beavertail safety, skeleton hammer, and an aluminum trigger. It comes standard with two 6-round magazines. New from Chiappa, the PolyLite™ Rhino was shown to wholesalers at the (NASGW) Expo. 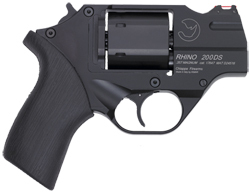 The new revolver is a variation of the existing Rhino line, obviously seeking to capitalize on the CC market. This lighter gun with a relatively slim profile may well find a niche with self defense folks. The PolyLite Rhino should look very similar to the other 2″ guns in the companies line up. The PolyLite™ Rhino will be available only in .38 Special, unlike the other revolvers in this series of guns which come in 357 Magnum. Pre SHOT Show, it’s not known if the revolver will be rated for +P, or standard pressure ammo only. The six round cylinder appears similar in size to the existing Rhino revolvers. Expect a shortened cylinder to prevent loading of .357 cartridges. A 2″ barrel model will be introduced first. No indication whether longer barreled PolyLite™ revolvers will be produced in the future. Black is the only available color for the new design. If the guns sell well, other frame colors are always a possibility. The guns use a red fiber optic front sight and a fixed rear notch. We will try to get a look at this one for you at SHOT. This conference has become an important part of the firearms trade, helping gunsmiths and employers to locate each other. The Gunsmith Conference and Career Fair is the perfect venue for prospective, student or working gunsmiths to interact the with industry’s top employers and personalities. Further, it’s great opportunity for those firearm-related companies looking for qualified gunsmiths, or to show off their products to key customers. As in year’s past, there will be no charge for individuals or companies to attend. The industry-exclusive event will again be held at the Downtown Marriott in Des Moines, Iowa, April 1-2, 2014. In addition to the unique networking and potential employment opportunities, the Gunsmith Conference and Career Fair will feature a host of seminars ranging from firearm-specific topics to business tips for gun shop owners. Among the speakers already signed up are Steve Sanetti, President of the National Shooting Sports Foundation, Les Baer, owner of Les Baer Custom, Stan Chen, owner of Stan Chen Custom, Jason Hornady, Vice President of Hornady Manufacturing, and legendary gunsmiths and gunmakers Joe Balickie, Jerry Fisher, Ron Power, Sharon Dressel and more. Doug Turnbull of Turnbull Manufacturing will deliver the keynote address at Wednesday evening’s banquet. Can you rechamber my Rossi single shot, NEF Handi-Rifle or TC Encore? Our friends at 4D Reamer Rental LTD. are now offering rechambering for single shot rifles with break actions. In other words if the barrel comes off, then they will work on it. Things to consider when thinking about rechambering a single shot barrel. 1. The bore diameter must be the same for the new cartridge as it was with the original, unless you are willing to rebore the barrel as well. (Reboring is cheap). 2. You must pick a chamber that is larger than the original chamber, ideally, larger in diameter and at least a little longer. Sometimes the original neck diameter was on the large size in the factory chamber and when you rechamber it leaves a small groove or mark in the neck area. Normally this is not a problem for function, but it leaves marks on your brass. 3. Ackley Improved cartridges do now work well for single shot rechambers unless your starting from a much smaller case, like a 22 Hornet to a 22-250 AI. This is because of how they are headspaced. 4. If you working with rimmed cases then an Ackley design is fine in a single shot simply because the rim handles headspace. 5. The twist rate of the original barrel should be compatible with the bullet you will likely be shooting in the new chamber. For ideas on rechambering options see this page at 4D that offers suggestions. Almost forgot, they can rechamber your Savage barrel too. Monday through Friday, 9-5, Mountain time. Of course you can Email anytime.